The difference between celebrity and superstardom is now available as a keyboard. The ease with which everyday people can capitalize on even just a tiny bit of fame is no secret. Thanks to the growth of social media, getting discovered and stepping into the limelight is becoming more and more common for the average Joe. However, platforms like Twitter and Snapchat aren’t just increasing the likelihood of instant fame, they’re also increasing the potential for the subject to remain relevant. What used to be the notorious “15-minutes of fame” has transformed into what seems like an eternity. Talented teenagers on Vine have established careers as pop singers, meme artists have made maintaining their Instagram accounts full-time jobs and YouTube stars are receiving sponsorship deals left and right. Going viral is now a viable route to achieving “lasting” stardom. But what does the emergence of this new type of “celebrity” mean for existing A-listers? Shawn Mendes, 17-year old Vine sensation turned top-25 Billboard music artist, has 6.5 million Twitter followers. Pretty impressive amount, but the number pales in comparison to the likes of Taylor Swift (78.2 million) and Justin Timberlake (55.5 million). You may think it’s unfair to compare a youngster, albeit a successful one, to a pair of the most popular, top-performing household names in the industry, but there is a social media metric in which Mendes completely demolishes this duo—number of users followed. While T-Swift and JT seem to be very selective with whose content gets the honor of filling up their Twitter feed, keeping the list restricted mainly to other verified accounts of fellow starlets and business partners, Mendes follows a whooping 52.2K people – a huge proportion of whom are fans or accounts made by fans for him. He regularly retweets messages of encouragement and also replies to many to express his gratitude for their support. Rarely do you see a high frequency of direct interaction with followers when it comes to more high-profile celebs. And therein lies the major difference between the two camps: level of personal engagement with their fan base. It appears as though viral stars are much more likely to communicate candidly with their audiences; after all, since their newfound fame is almost directly attributable to their fans’ support, it makes sense that these stars would be grateful. I’m not suggesting that every A-lister should go click happy and follow all their crazy aficionados. Why should they? Replying individually to the hundreds of thousands of mentions, messages and comments they receive every day would be exhausting, time-consuming and quite frankly, unnecessary. I wouldn’t know, but I’d imagine it to be the equivalent of having to text back that annoying classmate of yours who constantly wants to hang out. Plus, and probably most importantly, they don’t make any additional money off of it. So how can celebrities maintain fame? As the line for what qualifies someone as famous blurs more every day, how can they continue to demonstrate their dominancy? How can they continue to influence society, for better or for worse, and trend set in the midst of this fresh competition? Viral stars may be able to garner a solid following on social media, sign endorsement contracts to promote products and walk red carpets, and they might get invited to events, schmooze with people cooler than them and bring home a paycheck you can only dream about, but having your own line of emojis? That’s a privilege reserved for the upper echelon of influencers. Back in 2015, Kim Kardashian “broke” Apple’s App Store when she released her Kimojis. For $1.99, you could have full access to a set of 250+ Kim-themed emojis that reflect important themes in her personal life (e.g. her infamous behind and Yeezy merchandise). Sometimes words can’t express how you’re feeling, but an icon of Kim’s classic crying face sure can. Say what you want about the Kardashians, but boy do they know how to make money. Kimoji soared to top of the charts for paid apps in the App Store, and at one point, was reportedly being downloaded 9,000 times per second, earning Kim a generous sum of $1 million per minute. In case that didn’t sink in, let me repeat that for you. Every minute, Kim was raking in ONE MILLION DOLLARS. And I thought I had it made earning $20/hour at my internship this summer. One million dollars per minute. With revenue like that, it’s no surprise others quickly jumped on the bandwagon. Fetty Wap, Blac Chyna (cc: Kylie Jenner) and Ariana Grande are just a few who have emojified their life, allowing everyday people to incorporate celebrity images into their daily texting. 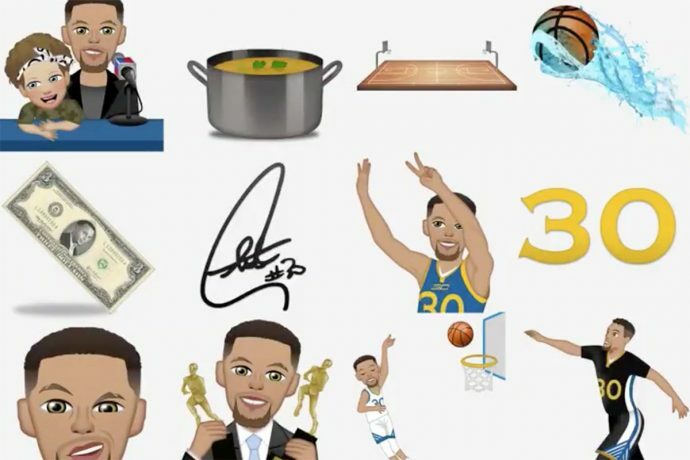 With this week’s launches of StephMoji and Justmoji, not only have Steph Curry and Justin Bieber joined the party—both of them have beaten out Kimoji in the App Store. For $1.99, Curry’s app features him doing essentially what he does in real life: chewing on his mouth guard, splashing threes, holding the championship trophy and cooking. Don’t worry, his wife, Ayesha, and adorable daughter, Riley, do make appearances as well. For $2.99 (damn, J-Biebs wants that extra dough), Bieber’s app resembles more of a Bitmoji style, featuring images of him flashing his abs, making funny faces and shooing away paparazzi. You can also send emojified song lyrics, so next time you need to send some positive vibes to a friend, why tell them “never say never,” when you can opt for the “Never Say Never” Justmoji? Depending on who you talk to, the reception to customized emoji keyboards, like most things, varies. Some may be repulsed at their mere existence, while others may find them a fun, cutesy way to spice up conversation. Objectively speaking, however, these apps provide another vantage point into the stars’ lives. By flipping through the little images they have personally curated and designed, you can learn their sense of humor, what they find important in life and in a way, gain a more holistic understanding of their personality. [Insert name here]-mojis not only allow for major celebrities to engage with fans without explicitly interacting with them, but they also allow for them to constantly be present in dialogue that’s not even about them. Essentially, it’s free marketing. Steph Curry, Justin Bieber and Kim K don’t need to follow their fans back or reply to their countless messages, because oftentimes, they literally are the message. While several viral stars have broken into the celebrity network, I find it highly unlikely that any of them will be producing a personal emoji keyboard any time soon. Just think about it. Each app includes hundreds of emoji possibilities. That means there are hundreds of images from Kim Kardashian’s life that are meant to resonate with the average person enough that they would use them in conversation. If that doesn’t seem like a whole lot to you, try designing your own emoji keyboard and see how many ideas you can come up. It’s a whole lot harder than you might expect; hence, why it’s a privilege to have one.